Pollution in the Greater Colombo area and the non-maintenance of newly created facilities have angered President Maithripala Sirisena. He summoned all those who are responsible — Mayors of Colombo, Kolonnawa, Moratuwa, Dehiwala, officials of the Urban Development Authority (UDA), the Low Lying Areas Reclamation Board, and the Environment Police among others — to a conference. The President first showed them a video clip. It highlighted how areas in the City and suburbs, once clean, have been polluted and dirt strewn all over. “Things have become worse after the January 8 Presidential election,” the President pointed out and added “whether you like it or not, as the then Urban Development Ministry Secretary Gotabaya Rajapaksa did a better job.” It is bad now and things are worsening, he said. Then came Mr. Sirisena’s bombshell. “I will give you one week. If you don’t show any improvement, I will get rid of those who are dealing with these matters. I don’t care what positions they hold,” he declared. Urban Development Minister Rauff Hakeem who was on hand said he agreed there were some faults. He also agreed to make sure immediate action was taken. 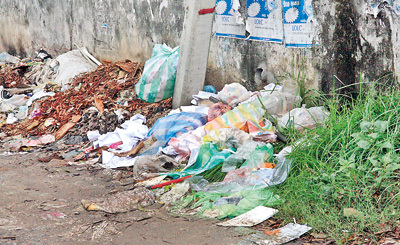 President Sirisena has received a number of complaints over the deteriorating conditions. The walking tracks were strewn with garbage and the minor staff tasked to keep it clean were not at work. Even the supervisors were taking a rest. Foreign Minister Mangala Samaraweera embarked on an official visit to Germany this week without an officer from the Ministry’s Europe desk. Additional Secretary A.A. Jawad, a senior career service diplomat, was to have been part of the delegation but was forced to stay behind over the most mundane of reasons – his visa was not issued in time. Some even speculated that Mr Jawad’s visa was rejected. That would have placed the ministry in a right pickle since Mr Jawad is also the country’s ambassador designate to Canada. But it transpires that the diplomat had only lodged his visa application the day before his scheduled departure. By the time it was issued, the ministerial delegation had left Sri Lankan shores. Seems even senior diplomats must submit their documents for a Schengen visa at least 48 hours before the date of travel. (But even the foreign ministry cannot get an emergency visa?). The competiion and jealousy among the fishermen’s federations in Tamil Nadu came to light this week with a rival federation asking the Sri Lankan Government to probe how an alleged ‘smuggler’ met President Maithripala Sirisena at the Presidential Secretariat recently. National Fishworkers’ Forum (NFF), a fishermen’s body, alleged that the Indian fishermen’s delegation that met the President included a ‘smuggler’ who posed off as their leader. The allegation of the NFF gained wide publicity in newspapers in Tamil Nadu. However, the representative whom they were referring to was a well-known union leader among the fishing community. S.P. Anthonymuthu, one of the coordinators of Indo-Lanka Fishermen Welfare Forum which arranged the meeting denied allegation levelled against one of the members in the delegation. “This is a result of jealousy after we got 37 Indian fishermen released from Sri Lankan custody following the meeting with the President,” he said. The other delegation members have decided to sue the federation on defamation charges. A protest too has been organised against this allegation in Tamil Nadu. A citizen has asked the Anti-Corruption Secretariat to probe the Rs. 10 billion bond issue at the Central Bank after Governor Arjuna Mahendran took office. The Secretariat, an official said, was now studying details related to the complaint before requesting “the appropriate” state agency to conduct a “detailed” investigation. It is expected to be forwarded to the Financial Crimes Investigation Division (FCID) of the Police. The Anti-Corruption Secretariat was set up after the Cabinet of Ministers chaired by President Maithripala Sirisena took a decision to this effect. The Secretariat, which now receives public complaints directs them to the respective state investigative arms like the FCID or the Commission Investigating Allegations of Bribery or Corruption. Another complaint the Secretariat is now scrutinising relates to a Rs. 100 million donation made by Ceylinco Consolidated Chairman Lalith Kotelawala for a playground in Biyagama. The Secretariat is unable to find out to whom the funds went though a donation has been made through an account in a State-owned bank. The Secretariat has now written to Mr. Kotelawala seeking his assistance to trace where the funds ended up. Air Marshal Kolitha Gunatilleke is to assume duties as Chief of Defence Staff (CDS) next week. He is to be promoted to the rank of Air Chief Marshal. He succeeds Lt. Gen. Jagath Jayasuriya, who retires next week and has been named Sri Lanka’s Ambassador designate to Brazil. mobs were attacking the Magistrate’s Court in Jaffna. and Energy Minister Champika Ranawaka. The riverside mansion reportedly built for a leading politico of the previous regime has become the subject of an investigation. The 20 acre property, sleuths say, is located in Kelaniya, on the banks of the Kelani Ganga. A front man, they say, has been described as the owner, but evidence pointing to ownership by the politico has been uncovered. Details of the multimillion rupee venture will be made public anytime now, sleuths say. Did a local bank delete transactions amounting to more than Rs. 700 million on the leasing of vehicles? Detectives of a special unit are trying to ascertain facts after reports that a fleet of vehicles had been obtained by the Liberation Tigers of Tamil Eelam (LTTE) through a front when it was fighting a separatist war. The day Prabhakaran was killed: Victory or Remembrance?